Don’t be jealous, but we’re having serious spring weather here in Omaha. It’s gotten me in the mood to lighten up my makeup look and sport brighter cheeks and lips. 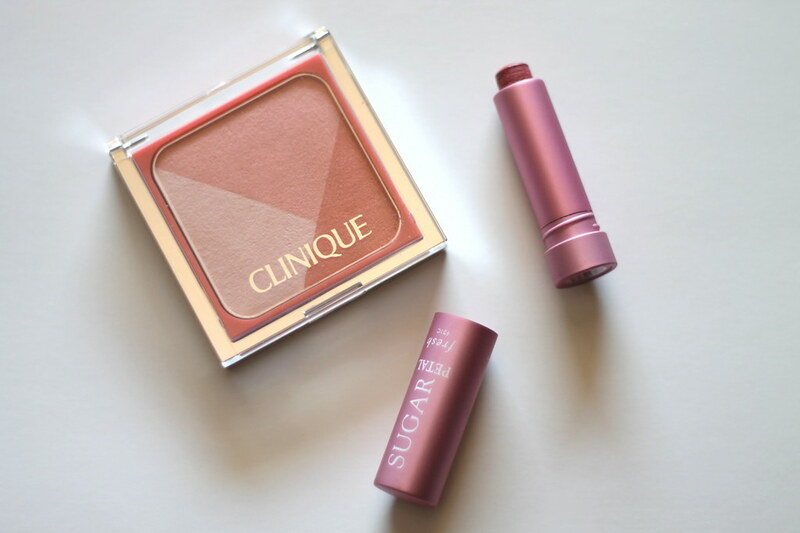 I’ve been putting some spring makeup to the test and discovered my perfect lip/cheek combination: Clinique ‘Sculptionary’ Cheek Contouring Palette in 01 Defining Nectars and Fresh Sugar Lip Treatment in Petal. Don’t discount Fresh’s sugar lip treatments if you’ve never tried them; they’re moisturizing and balmy, but the color isn’t sheer in any way. They pack on quite a bit of color, and this petal color is a little bit pink and a little bit mauve. Its cool tones work well in contrasting with and paving the way for the real star of the show, the Clinique cheek palette. It’s shimmery without being too sparkly and adds just the right amount of warm-weather glow we all crave around this time of year. You’re supposed to be able to use the three colors as blush, contour, and highlighter; I think it’s possible to do with some of the other colored palettes, but I wouldn’t do that with this particular one — it’s too pretty all blended together. What lip and cheek products are getting you excited for spring?